Pre & Post-Offer Defense Takeover Mechanisms - Veristrat Inc. Suppose you are a part of the top-level management of a successful company. The company is enjoying decent profit margins and has made a concrete position in the market. Would you ever want your company to get acquired by another company, specially when your plans are to scale up? No manager in the world would want that, except for the case where an exit is being planned. This brings us to the centre of discussion of this article, a “Hostile Takeover”. 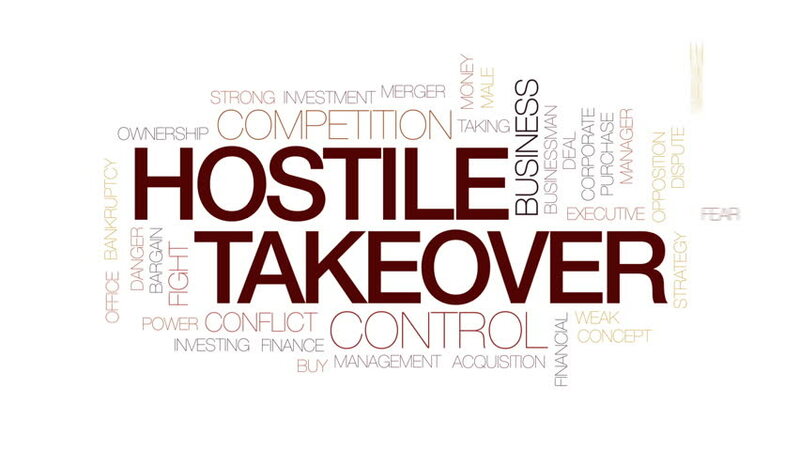 A hostile takeover is a type of acquisition where the acquirer takes over the target by approaching the shareholders directly. In other words, an acquisition of a company whose management is not in the favour of that acquisition. Tender Offer- In this case, the acquirer offers the existing shareholders, a premium over the existing price of their shares. The shareholders easily surrender their shares as they are getting a higher price than the market. This is to create a majority in the decision making of the target entity and get through the takeover. Proxy fight- This refers to the situation where multiple shareholders collaborate and create a majority for voting in favour of the acquisition. By doing this, they overpower the decision of the management. To avoid such hostile takeovers, the management opts some defence measures. These measures can be enacted either before the offer of the acquirer (Pre-offer) or after it (Post-offer). Let us go through each of these defence mechanisms. Poison Pill: This gives the current shareholders of the target company, a right to purchase additional shares of the new entity at a discount. This causes dilution of the new entity and increases the cost to the acquirer. Under this, a Dead Hand Provision can also be included where only the existing directors has the right to cancel this Poison Pill and the new directors are deprived of such a right. Poison Put: This gives a right to the existing bondholders of the target entity to ask for immediate redemption of their debt. This is to create an additional cash burden on the acquirer which might make the acquisition unprofitable. States with Restrictive Takeover Laws (US): Companies would like to be incorporated in the countries which have restrictive takeover laws as it would be very cumbersome for the acquirer to fulfil the requirements asked by the regulatory authorities. United States of America is one of the examples of such jurisdiction. Staggered Board of Directors: Under this, only a part of BOD can be changed every year. For example, a company has 12 directors on the board with only one third (4) of them coming up for election in one year. This requires the acquirer at least two years to gain majority in the board of directors. Restricted Voting Rights: A provision can be added by the company that if the stake of one of the shareholders crosses a threshold percentage, that shareholder will lose his voting rights. This provision can also be levied by the regulatory authorities to conserve the competition in the market. Supermajority Voting Provision for Mergers: A provision can be included where a majority of more than 51% is required to approve a takeover. For example, if a provision is added where at least 75% of the votes should be in the favour of the acquisition for it to take place, a shareholder with just 26% stake can also resist the takeover. Fair Price Amendment: This provision restricts the takeover to happen unless the shareholders are being paid a “fair price” for their shares. The valuation of the company is done through a special formula or by an independent appraiser who enlighten the shareholders with the appropriate amount that they should ask from the acquirer. Golden Parachutes: Compensation agreements can be made between the target company and the top-level management for lucrative cash pay-outs in case they leave the company following an acquisition. Since these managers are paid in abundance, this can be huge burden on the acquirer. Just Say “NO” Defence: If the acquirer goes directly to the shareholders with a tender offer, the target company can make a public announcement addressing the shareholders why the acquirer’s offer is not in the shareholder’s best interest. They might also communicate that there are a lot of opportunities available in the near future which the acquirer would not be able to monetize. Anti-trust: Defines that this acquisition will lead to a Monopoly in the market which is against the Competitions Law. Violation of Securities Law: The target company might claim that the acquirer has bought the shares in an illegal way. Even if this measure does not relieve the target company from the acquisition completely, it will still buy them a lot of time. Greenmail: Under this, some amount is paid to the acquirer to terminate the takeover offer. In some cases, the target company purchase the shares from the acquirer at a premium following an agreement that the acquirer will not make another takeover attempt. This is hardly followed in the US now as the profits made by the acquirer are charged at a tax rate of 50% by the government. Share Repurchase: The target company can submit a tender offer for its own shares which will compete with the bid offered by the acquirer. This can require the acquirer to raise its own bid which might make the takeover less attractive for the acquirer. Levered Recapitalisation: In this case, the target company takes up large amount of debt just to make significant changes in the capital structure and make the acquisition less attractive for the acquirer. This debt can also be taken up at unfavourable terms to create problems for the acquirer. They are ready to face the brunt if the acquisition does not take place. Crown Jewel Defence: The target entity might sell of the subsidiary or the asset that was the major reason behind the offer made by the acquirer. The subsidiary or the asset is generally sold to a neutral third party. Pac-Man Defence: This is quite an interesting takeover defence mechanism where the target makes a counter offer to acquire the acquirer. White Knight Defence: The target company invites a friendly third party with a good strategic fit to get acquired. This justifies a higher price than a hostile takeover. It may also lead to a competitive bid and therefore the acquirer overpaying. White Squire Defence: In this case also, the target company invites a friendly third party, but this time to acquire a minority stake in the entity, just to block the hostile acquirer from gaining enough shares to complete the merger.